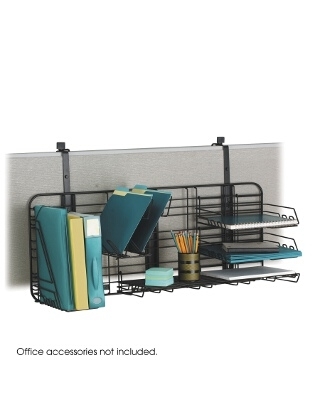 Make your cubicle walls work for you with the files-in-their-place, lots of space GridWorks System! Strong welded steel construction in a continuous-loop design with hardened epoxy finish that stands up to the durability challenge! The components lock into place on your gridwall but can be easily repositioned. Plus, Safco's Panelmate Organizers are completely compatible with the GridWorks System so you can truly customize your space. Gridwall unit, two letter trays, two slot sorter, a binder bin and two-foot shelf all included. Universal mounting system also included.